It’s beginning to look a lot like Christmas. There are various ways of telling when Christmas has arrived in Cyprus. Sometimes it rains, but usually not. Although this year seems to be the exception. Sometimes an influx of relatives arrive from abroad. But again, this is pretty normal. Without exception, the large revolving Santa-Claus head appears in the big Limassol round-about by the sea. And also Christmas cookies start to catch the eye in the bakeries, homes and workplace. This year I flew to Canada for Christmas, and then off again on a family vacation, so I have had limited time in the kitchen but did manage to make some sweet, soft pasta flora cookies before escaping from my Canadian igloo. Our family makes these cookies at Christmas time to give away with the other yummy traditional cookies, but they can be made throughout the year. 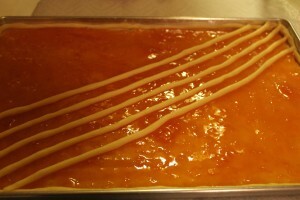 In addition, although my family makes these with apricot jam, you can use whatever jam you would like. Makes about 54 small cookies. 1. Preheat the oven to 180 degrees Celsius. Beat the sugar with butter until fluffy. Then add the egg yolks one at a time, beating the mix well after each egg yolk. Add the cognac and the vanilla. 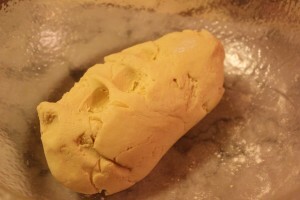 Then, by hand, add the flour, baking powder until a nice soft dough is formed. 3. Make more rolls and place them diagonally over the jam to create a diamond pattern. 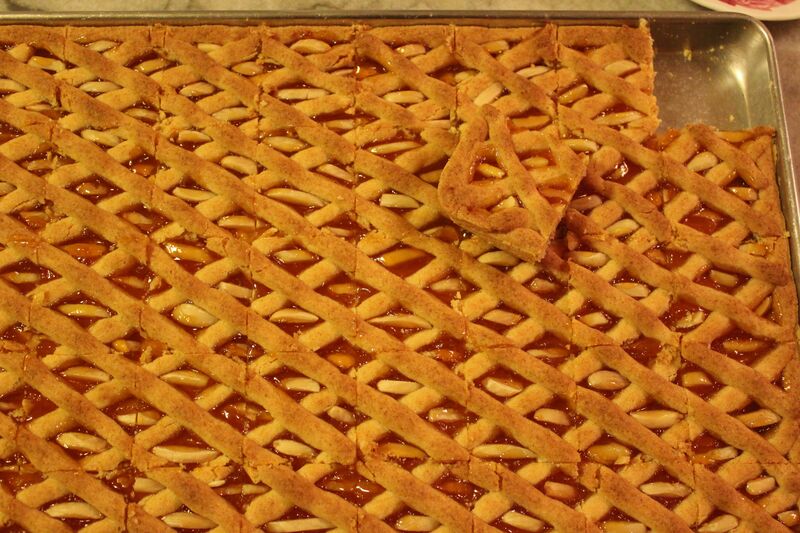 If you wish, then place small roasted almond pieces in each diamond pattern. Place in the oven and cook for about 35 to 40 minutes., until the dough is golden brown in colour, as in the picture at the very top of this blog. Once they are cooked, let the cookies cool and then cut into as many cookies as you wish. 4. Then place them in cute little cookie holders and give them away as Christmas presents, or simply gobble them up at home like me. … And so begins the festive season during which I rapidly begin to resemble piglet from Winnie-the-Pooh with my seasonal eating skills. Deck the halls everyone! Wishing you all a wonderful Christmas period and see you all in the New Year.